5-Slide Unit. Holds 5 single 1" x 3" slides vertically, or 10 slides back-to-back. Slides extend above the opening, allowing for the manipulation of them without the use of forceps. A screw cap has a metal foil liner that withstands stains and organic solvents and it prevents evaporation. Overall measurement: 3 ⅜" H x 2⅜" W base x 2⅜" (dia) top. 5-Slide Unit. Holds 5 single 1" x 3" slides vertically, or 10 slides back-to-back. Slides stay within the jar so that it can be capped during staining. Complete with a screw cap and a metal foil liner. Overall measurement: 4⅜" H x 2¾" W base x 2⅜" (dia) top. For use with cover glass sizes 18 to 22 mm, accommodating up to eight back-to-back. Plastic screw caps have been tested to be resistant against most staining solutions. An all glass jar which holds 5 to 10 standard slides (3" x 1"). 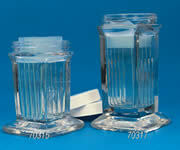 They can be used as a chromatography jar with a choice of 2 ground glass lids. The lids are ground to the flange of the jar which deters evaporation. The jar with a taller lid (70316-04) accommodates larger slides: 4" x 1" (102 x 25 mm). This cover glass trough features 12 equally spaced grooves which will support round or square cover glass sizes 18, 22, 25, 50 mm, as well as standard rectangular cover glasses up to 22 x 32 mm size. Made from polished stainless steel. Specially designed to be used with coplin jars. Holds 10 CoverslipsFast & easy cleaning, surface-treating and drying. Holds all slipcover sizes including 18, 22 and 25 mm. Durable and Hassle Free One piece polypropylene rack does not require assembly and is chemically and thermally resistant. Autoclavable! Secure Innovative design includes a notch to secure coverslips with a rubber band or loop of monofilament. Compatible Fits inside a 100 ml beaker with space underneath for a small stir bar when submerged. Economical Available at a fraction of the cost of PTFE products. Maximum Circulation Offset design allows liquid and air to completely flow around the entire slide ensuring cleanliness and faster drying times. "Hands Off Design" Tailored to contact a minimal amount of slide surface area permitting solutions and air to affect entire slide. 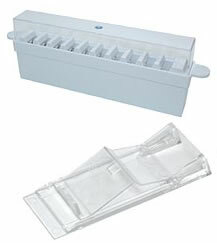 Holds 12 Slides Securely holds slides for convenient cleaning, treating, staining, and drying. Fits standard slide sizes including 25 mm and 1". Laboratory Friendly Utilizes chemically and thermally resistant glass infused polypropylene. Autoclavable! Create A System Use in conjunction with a 200 ml tall form beaker to efficiently use solutions. Innovative design saves you time and headache when you are looking for a cover-glass holder! This rack is machined from polypropylene and fabricated to accommodate a variety of cover-glasses in different sizes. With The ability to simply adjust the holder to fit your desired size and then securing it by tightening the reset screws with the hex key (hex key is included)all sizes of cover glasses are accommodated. Because the holder is made from non ferrous material, it is microwaveable. The rack accommodates 10 cover glasses, round, square or rectangular, adjusting from 5 to 60 mm. Removable handle. Rack comes with two set of holding rods. One set accommodate cover glasses from 5 to 25 mm, and the other set for cover glasses from 5 to 60 mm. 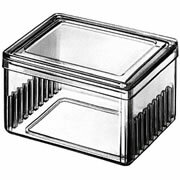 An all glass rectangular staining jar which accommodates 8 to 16 slides and comes with a glass lid. Its wide top eliminates the need for forceps in the handling of the slides. It accommodates slides up to 4" x 1½" (102 x 38 mm) in size. An unbreakable, high-density polyethylene Staining Jar with internal grooves and a shallow screw cap. The jar holds 5 single 1" x 3" slides or 10 back-to-back slides vertically. Overall measurement: 4½" H x 2½" (dia). 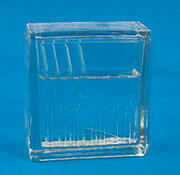 Soda lime glass staining jar, resists staining from Eosin or Hematoxylin. Dimensions: 80mm x 70mm x 40mm. This jar comes with glass cover to reduce stain evaporation. Holds 10 slides back-to-back horizontally. Heavy, clear, soda lime glass stain dish, accept glass slide measure 75 x 25 mm or 3 x 1". This dish comes with glass cover, holds 20 slides back-to-back horizontally. Inside dimensions: 3" x 2-5/16" x 1-3/16" deep. The EasyDip™ Slide Staining System has two components: a square staining jar and a 12-position vertical slide staining rack. Jars can be loosely joined to each other laterally, therefore making sure they are kept in the same order when moved around on the lab counter. They also are available with five different colors to help better identity contents or applications. The Staining Jar being made from acetal plastic will not break like most glass jars do. It will resist attacks from most staining reagents including alcohol and xylenes but not phenols. The wide stable base offers greater stability while the inside is recessed, allowing for a smaller reagent volume of only 80 ml. Ideal for frozen sections, small jobs and special processes. Dimensions: 2½" x 3" x 3⅝" (64 x 76 x 92 mm). The EasyDip™ Slide Staining Rack will hold up to 12 slides of 25 x 75 mm or 26 x 76 mm (3" x 1") with a thickness of 1.0 to 1.2 mm. These racks are safe at temperatures up to 120°C. The lid completely covers the EasyDip™ Slide Staining Jar to minimize spill and evaporation. The handle is permanently attached to the rack for easy insertion or removal of the slide. The base of the rack is placed in the vertical position to ensure the slides are in place, and are rotated sideways for easy slide removal. For your convenience, we offer EasyDip™ Slide Staining Kit. Kit consists of one Staining Jar and one Staining Rack, color white. A universal slide rack and container for Autoradiography and all other staining techniques. It is molded from black Polyethylene-terephthalate (PET) plastic. This unbreakable plastic has many advantages over glass in cytological and histological laboratories. There are no metals to corrode. The rack and dish are easy to clean and are resistant to most laboratory chemicals. 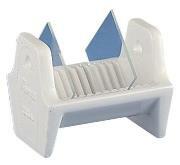 The slide rack has an open bottom for rapid draining when transferred. It holds 1" x 3" (25 x 76 mm) slides in slots numbered 1 to 25. This unbreakable 3.7" L x 3.2" W x 1.9" H (94 x 81 x 49 mm) staining dish has a light tight cover with a compartment for the drying agent and a perforated slide partition to support the drying agent. The partition has index numbers and a surface for writing. Included is a removable clip which is placed on the top edge of the dish permitting staining solution to drain back into the reservoir from the tilted rack. Staining takes place in complete dark-ness. 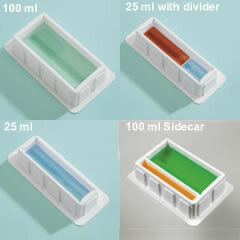 The small size of the dish saves on staining liquids, developing fluids and intermediates since only 150 ml is needed. Actual capacity is 250 ml. The light tight lid is essential for evaporated baths. The dish is easy to clean and especially suited for the storage of enzymes. The cover will not jam in freezer storage. The dish is made from polymethylpentene "glass clear" for use with our staining rack (Cat# 70321-10) shown above. It comes with two lids; one lid should be used when the rack is not inserted. It measures: 3 ⅛" x 4 x 3⅜" (81 x 102 x 86 mm). 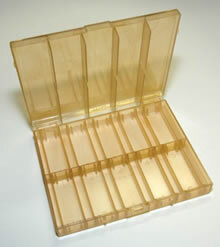 A stainless steel tray with grooves that hold 3" x 1" (76 x 25 mm) microscope slides vertically. Accommodates up to 60 slides. A stainless steel tray with grooves to hold various microscope slides horizontally. Accommodates up to 60 slides. Ideal for immersing slides in several solutions. The removable Stainless Steel slide rack has an open bottom which allows for rapid filling and draining. It holds 60 slides: 3" x 1" (75 x 25 mm) Staining dish dimensions: 165L x 95W x 100H mm. Ideal for immersing slides in several solutions. The removable Stainless Steel slide rack has an open bottom which allows for rapid filling and draining. It holds 30 slides: 3" x 1" (75 x 25 mm) Staining dish dimensions: 105L x 95W x 100H mm. A variety of inexpensive staining dishes made from molded glass with and without fitted glass and Stainless Steel lids. The Hellendahl type dish for the staining or use as a TLC developing chamber. Holds up to 8 individual 3" x 1" (76 x 25 mm) slides, or 16 slides back-to-back. These dishes are made from soda lime glass. The approximate inside dimensions: 76L x 25W x 75D mm. Ideal for immersing slides in several solutions. 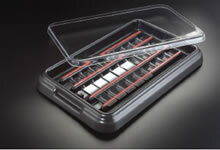 The removable glass slide rack has an open bottom which allows for rapid filling and draining. It holds 20 slides: 3" x 1" (75 x 25 mm) or 3" x 1½" (75 x 38 mm) or 3" x 2" (75 x 51 mm) in size. Staining dish outside dimensions: 107L x 87W x 70H mm. Staining dish inside dimensions: 95L x 76W x 64H mm. Slide rack outside dimensions: 91L x 68W x 49H mm. Slide rack inside dimensions: 78L x 60W mm. Our complete set consists of 1x Staining dish, 1x Cover, 1x Slide Rack and Handle. These glass staining dishes are made of a heavy glass with snug fit lids. They come in three different sizes to accommodate the 20, 30 and 60 place slide racks. Complete set includes one staining dish with lid and one handle rack. These mix and match components offer greater flexibility in meeting your requirements. 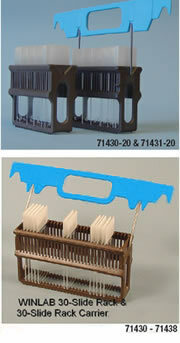 This staining dish accommodates 16, 20 and 30-slide racks (listed below). Slides range from 3" x 1" (76 x 25 mm), 3" x 1½" (76 x 38 mm), and 3 x 2" (76 x 51 mm), and 3" x 2" (76 x 51 mm). The dish is made from soda-lime glass. The approximate inside dimensions are: 135H x 102W x 69D mm. The out side dimensions are 146H x 113W x 83D mm. 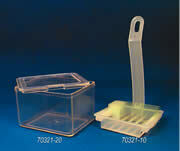 30-slide staining set consists of one Staining Dish, one Lid, one 30-slide stainless steel Rack. This unique staining kit has a removable pan and rack and may be used in various areas of the lab including microbiology, gram staining in histology, special staining in hematology, and microscopy. The full kit comes complete with a base that is attached to a leveling indicator, four leveling feet, removable rack, and removable tray. The collection bottle and tubing are sold separately as an option. It includes three feet of tubing and bottle. These slide staining tray and dish sets are ideal for a wide variety of routine and special histology staining procedures. 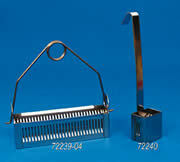 Made from stainless steel, they are available in either 30 slide or 60 slide capacity. They come complete with a cover. 4.5 (L) x 3.5 (W) x 3 (H)"
8 (L) x 3.75 (W) x 3 (H)"
The industry standard for small batch and frozen section staining applications. This 30-slide rack is made from non-tarnishing stainless steel and it is resistant to most staining solutions. The handle is permanently attached but it is swing-able to permitting for closure of the dish and easy insertion and removal of the slides. OAD: 3.1 x 4 x 1" (79.5 x 100.5 x 25.4 mm). This glass rack holds up to 26 single slides, or 32 slides back-to-back. This glass rack holds 20 single slides, or 40 slides back-to-back. This rack is made from soda-lime glass. A stainless steel, slotted rack, designed to hold 50 slides in a variety of sizes: 3" x 1", 3" x 1½", and 3" x 2". The unit measures approximately 200 x 105 x 83 mm overall. The rack is made from nontarnishable stainless steel and is resistant to most staining solutions. The handle is permanently attached allowing for closure of the dish and for easy insertion and removal of the slides. The inside of the staining dish measures: 186L x 89W x 68H mm. The complete set consists of 1x dish, 1x rack, and 1x cover. Sakura Finetek - Designed for staining histological and cytological specimens. With up to 12 solution wells, each deep enough for total immersions of 1 x 3" microscope slides. The set comes complete with a metal frame and a snap on locking cover that protects from spills. The set consists of 10 white polypropylene dishes and two green solvent resistant dishes. Additional staining dishes and 24-slide holders with removable handles are sold separately. Fixed Handle Rack: A stainless steel rack with a fixed handle for use with large slides. The rack is grooved to take 76 mm microscope slides up to 50 mm wide horizontally. The rack accommodates up to 24. Vertical Slide Rack: A stainless steel rack with a fixed handle and grooves to take 76 x 26 mm microscope slides vertically for maximum use of space and solution. The rack accommodates up to 48 slides (24 slides each row). Fixed Handle Rack (#71422-FR): A stainless steel rack with fixed handle for use with larger slides. The rack is grooved to take 76 mm microscope slides up to 50 mm wide horizontally. The rack accommodates up to 55. Vertical Slide Rack (#71421-VR): A stainless steel rack with a fixed handle and grooves to take 76 x 26 mm microscope slides vertically for maximum use of space and solutions. This Large Staining Dish (#71422-DL) accommodates two vertical racks (#71421-VR),which totals 96 slides. EMS has introduced a complete Stainless Steel (316-Medical Grade) rack with 30 slide capacity which is chemical and corrosion resistant and able to be sterilized and autoclaved. The rack comes complete with a removable, positionable handle which allows for use of the rack with or without the handle. The rack measures 4⅜ x 313⁄16 x 1" (H) (111x97x25mm). The rack will accomodate 4" (100mm) slides. 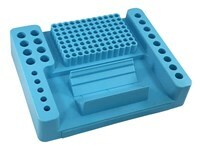 These racks may be used in any of the following slide dishes with or without the lid. 71460-DI, 70312-31 or 71423-DL. The unit consists of four-bar racks which accommodates 22 slides (3" x 1"), and a slotted rack which accommodates 10 cover glasses. A stainless steel tray catches excess stain solution as it drains from the slides. The unit measures: 12½" L x 9½" W x 2" H (32 x 24 x 5 cm). A stainless steel rack with grooves to take 22 x 22 mm coverslips vertically. It accommodates 25 coverslips at a time. Stain, Rinse and Dry on a Single Tray - Then Simply Throw Away! Stain, rinse, and dry your slides on a single working tray. Use the tray for a clean and fresh working surface area for staining. These trays are made from a polypropylene / polyethylene blend and are very durable. Stain, rinse, and dry your slides on a single working tray. Use the tray for a clean and fresh working surface area for staining. The deep well can hold liquid waste up to 38 ml. Place eight slides comfortably onto the base. With its compact size, the tray provides comfortable transport from work area to sink. Convenient pour spouts to easily dispose of unwanted liquid waste. Unique dark lid protects slides when used with fluorescents. 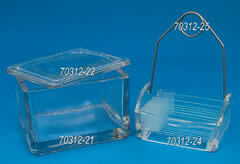 The tray measures 305 mm L x 127 mm H x 29.5 mm and holds up to 8 slides maximum, with a 38 ml liquid capacity. The set comes with four base trays and one lid. The dark lid protects the slides for light sensitive applications. 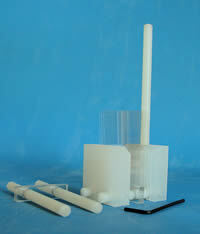 Standard 4 channel, 8 channel, 12 channel and various special purpose pipettes are all compatible with these disposable, polystyrene reservoirs. To facilitate easy, dripless pour-off of unused reagents and solutions, all versions have indented "spouts" in each corner. Bottoms are formed with a sharply tapered "V" shape to minimize waste and reagent consumption. They are packed in environmentally friendly packaging, within biodegradable bags and recycled cardboard boxes. Our new ASPIR-8™ is the ideal reservoir for any lab utilizing 8 channel pipettes. The strict inner dimensions are designed specifically for 8-channels, thus conserving space and reagent over its longer 12-channel counterparts. This thinner design minimizes reagent exposure and usage. ASPIR-8 is the only reservoir that is tailor-made for your 8-channel instrument. The 8PLUS4™ reservoir allows for multiple solutions in one reservoir for easy and diverse experimentation. The thin divider wall is strategically placed so that a 12-channel pipette can still be used effortlessly, making the 8PLUS4 one of the most versatile solution reservoirs on the market today. Convenient - Pour-off spouts on all four corners. Stable - A wide base provides stability and avoids spills. Measurable - Graduated marks on inside wall. Sterile - Sterilized by gamma irradiation. Compatible - 25 ml Reservoir with divider accommodates eight channel pipets on one side and one to four channel pipets on the other. The divider is also convenient for adding controls. Options - Offered in bulk cases or individually wrapped (ideal for use in clean rooms). A special additive helps the plastic bio-degrade by allowing bacteria and other organisms to breakdown the complex molecular chain. This speeds up the process to reduce the resin to its natural components within five years as opposed to 1,000 years or more. 100% Eco-Friendly - Each case of Bio-Pure Reservoirs are packed in bio-degradable bags and recycled cardboard cases. Extend benchtop working time and keep reagents cool up to 3 hours. The holder is designed to hold securely five 1 x 3" microscope slides. It comes with a handle for easy manipulation. Up to 50 slides (10 holders) can be processed at one time in one staining vessel from start to finish without interruption. The slide holder has two sides- one being black and the other white. This allows for easy grouping and identification of the slides. 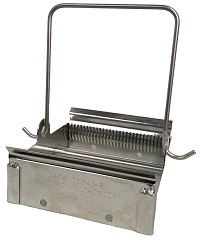 The holder is ideal for both frozen and paraffin sections. The holder measures: 6¼" x 3½" (159 x 89 mm) excluding the handle. WINLAB 30-Slide Racks are available in two models: LS-30 and LSM-30. The LS-30 is held rigid by the carrier the same way as the Sakura/Bayer models, preferred for Leica stainers. Handle positions: 1 x vertical, 2 x 45°, and 2 x 90°. The LSM-30 version swivels by carrier as does the Medite stainless steel racks and has the advantage of fitting Leica, VBS, Bayer, Sakura, Medite, coverstaining machines and Sakura tape coverslipper. WINLAB 30-Slide Racks measure: 4½" L x 1⅜" W x 2½" H (115 x 35 x 64 mm). 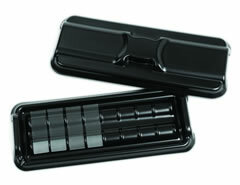 WINLAB 20-Slide Racks are available in two models: LS-20 and LSM-20 (LSM-20 fits Medite stainers). WINLAB 20-Slide Racks are fitted to a Sakura Staining Dish, either Green or White and also fits most other staining dishes. Racks measure: 3" L x 1" W x 2½" H (77 x 25 x 64 mm). 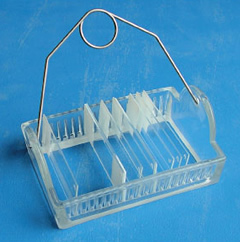 Steel wire hooks are molded to the polypropylene handle to form Slide Rack Hanger. The Slide Rack Hanger is very easy to attach or detach from the WINLAB Slide Racks. 30-Slide Rack Carriers fit all Models LS-30 and LSM-30 above. Same construction as 30-Slide Rack Carrier but fits all LS-20 and LSM-20 Slide Racks. Steel wire is bent to form a handle. Use these handles for manual staining and the Medite stainer. Model W3-5 fits all WINLAB 30-Slide Racks. Model W3-6 fits all WINLAB 20-Slide Racks. These handles are economical as well as microwave safe and solvent resistant. They may be used for all manual staining to avoid unwanted chemical and heat contact. An ideal device for immunohistochemistry slide staining. The StainTray™ has a black base, made from tough ABS plastic, withstanding a wide range of chemicals (except chlorinated hydrocarbons). It will accept up to 20 slides on four plastic rails covered with a polymer strip to perfectly hold the slides even if the tray is held at an angle. When humidity is needed, the wells between the rails will hold the water securely without splashing. Rails are raised not only to avoid water touching the slides but also make the slides more easily retrievable. The base will also hold excess stain solution that drips from the slides. Four rubber feet add to the base for stability. Units are stackable to save space. A black cover for fluorescent work. Made from ABS with a temperature range of -80°C to 80°C. Replacement parts for Sequenza™, a system designed for immunolabeling of sections on glass slides. Ideal for both benchtop techniques and microwave-assisted applications. This system maximizes the results produced up to 50 slides per run, maintaining both consistency and quality. The Slide Rack holds 10 glass slides, with a coverplate forming a capillary gap between the slide and the plate. A hopper easily dispenses the reagent into the gap formed between it and the coverplate. Clean with 10% bleach solution; rinse with water. This low-cost, high precision moisture chamber for ten slides is another innovative product from Evergreen. Each moisture chamber is divided into ten individual compartments with approximately half-inch empty space between the compartments. When the chamber lid is closed, eight barrier dividers are placed into the empty spaces between the microscope slide compartments completely isolating all compartments. This is a very desirable feature when doing immuno staining. The microscope slides are placed on four pedestal posts and four corner posts each 0.460 inch (11.5 mm) high thus raising the surface of the slides approximately half-inch off the floor to keep the slides away from the water below and to make the slides easily retrievable (either by hand or by forcep). The chamber is fabricated out of heavy-duty polystyrene with an air-tight design to keep moisture in. The chambers are designed to be stackable in order to save counter and/or refrigerator space.